Difference between revisions of "Golf"
'''Golfing''' in the [[Grand Theft Auto series]] is primarily represented in the form of various golf courses, which first appeared in [[Grand Theft Auto: Vice City]], as well as golfing tools and attire. However, only [[Grand Theft Auto: Vice City Stories]] and [[The Ballad of Gay Tony]] episodic game for [[Grand Theft Auto IV]] features golfing as an actual [[minigame]]. The game mechanics of the minigame in both games is similar in that the player is required to time their swings as accurately as possible by plotting an oscillating cursor on a bar as close as possible to a designated point, thereby resulting in a more accurate shot. In the Ballad of Gay Tony, the shooting mechanics is slightly improved to increase the challenge of gameplay; the further the target which the ball must go, the higher the point which the cursor must be plotted at is. In GTA Vice City Stories, golfing is only possible during "[[Home's on the Range]]". Golfing in The Ballad of Gay Tony is available after completing "[[Practice Swing]]", after which it can be activated by accessing the front entrance of the Golden Pier's Swingers Golf Course; players can choose to play with an anonymous competitor, or play with any of Luis Lopez's friends. 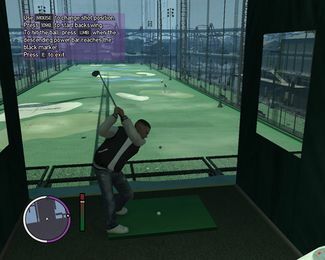 The golfing minigame in Grand Theft Auto: Vice City Stories, during "Home's on the Range". Teeing off during a round of golf in The Ballad of Gay Tony.